Nepal is located in the Northern hemisphere, landlocked between giant India to the west, south and east and to the north by China, which forcibly invaded and annexed Tibet in 1959. Its size is roughly that of North Carolina, and its latitude is on the same plane as Florida. The elevation varies from sea level in the Southern Terrai region to 4,800 feet in the mid-Kathmandu area, to the highest point on the planet in the north with Mt. Everest in the Himalayan range at roughly 28,000 feet above sea level. The distance from south to north is sometimes as little as 100 miles. ​With many distinct ethnic groups and well over 35 languages, Nepali is the common language. Kathmandu, the capital and largest city, is the home for our HIO program. Nepal has the densest number of world heritage sights in the world and unsurpassed natural splendor in its landscape. It is the poorest country in South Asia, with a mean annual income of $350, a literacy rate of 35% and a jittery government and economy with unemployment hovering near 50%. Because Nepal is a patriarchal, largely Hindu society that treats women as second-class citizens, girls and women are positioned to have no voice and are marginalized in every way. Even in relatively enlightened Kathmandu, the capital and largest city, religious and societal traditions dominate. Access to education is the single most important aspect in the life of a young girl. With education comes the possibility for the poor to improve their lives—to break an endless cycle of poverty that moves from mother to daughter and on and on for generations. Our aim is to provide the tools for families to change this narrative. HIO understands that poor young boys also deserve the right to an education, and this opportunity is often denied. Government schooling in Nepal is not free. However, with little money to spare, if there is a choice for a family to send either a girl or a boy to school, the boy will most often be given that opportunity. For this reason, in 1995 we made the decision to offer sponsorship opportunities to girls only. HIO is committed to improving the overall quality of education in our partner schools through a program of active teacher training. This educational intervention not only affects the girls and young women we sponsor, but also makes a difference for the thousands of students in our partner schools and the community at large. Near the metal factory where several of our HIO families live and work. 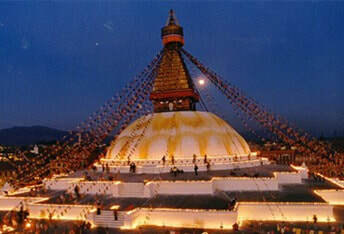 Boudhanath Stuppa, peacefully shared by Nepal's Tibetan Buddhist community along with its predominant Hindu neighbors, is a World Heritage Site.